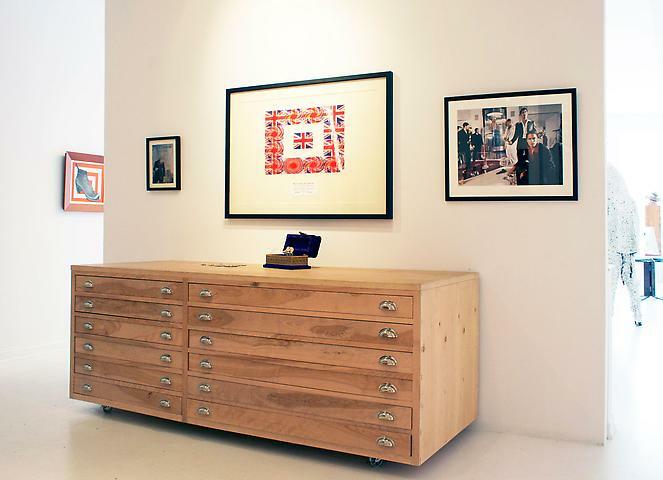 EAST HAMPTON, MAY 18, 2012: Eric Firestone Gallery is pleased to announce THE HABERDASHERY, an exhibition that plays off of the concept of high-­‐end men’s clothiers, opening with a reception on Saturday, May 26th from 6 -­‐ 9:00pm. With a contemporary vision, THE HABERDASHERY casts an eye toward men’s finery, celebrating the milliner, tailor, cobbler and malletier, as well as the goods and associative meanings that their work engenders. The word alone – haberdashery – conjures vintage clothiers the likes of Beau Brummell, whose tailored trousers and neat cravats helped to revolutionize menswear in 19th century England. Tailcoats, top hats and walking sticks were de rigueur for the proper dandy in Brummell’s world, but few could sustain the cost of such fashionable accoutrements. Brummell himself, undone by gambling debts and high living, spent the end of his life on the lamb in France, attempting to avoid debtor’s prison. Such style – indeed, such a lifestyle – would not have been possible without the haberdasher, who pampered and polished the 1% of his day. Enter Eric Firestone and the designer Ishi Glinsky, who have created a multi-­‐media installation in which contemporary art meets lifestyle, panache, and pomp. A diverse group of invited artists including Donald Baechler, Bast, Libby Black, Nick Cave, Willie Cole, David Colman, Jim Dine, Anh Duong, Dzine, Phillip Estlund, Gilbert and George, Kara Hamilton, Jessica Joslin, Tseng Kwong Chi, David Lachapelle, Greg Lauren, Charles LeDray, McDermott & McGough, Ryan Metke, Maynard Monrow, Garrett Pruter, Retna, Shelter Serra, Vadis Turner, Nari Ward, Mark Wilson, Erwin Wurm and Rob Wynne examine the zeitgeist’s outer limits through all manner of object, ornament, icon, and image. Eric Firestone Gallery is committed to breaking new ground with exhibits that stretch the limits of contemporary language. Current exhibitions include Return Trip, curated by Eric Firestone and Carlo McCormick, on view at Tucson’s Pima Air & Space Museum through June 30th and I’m An Artist Living in New York, an installation of historic photographs of famed 20th century artists as they celebrated the cultural phenomenon that was New York City in the 1960s, 70s and 80s. Curated by Eric Firestone, the exhibit is currently on view at c/o The Maidstone, one of East Hampton’s most compelling social venues. Eric Firestone Gallery has been featured in Art in America, Bomb, Artnews, The New York Times, The Huffington Post, GQ, New York Magazine, Hampton’s Magazine, Newsday and many other publications and websites. The response to Return Trip has garnered press from across the United States as well as Japan, England, Cuba, Germany, and Russia. In May of this year, Eric Firestone will appear on both Aljazeera and Channel One Russia, in conversation about The Boneyard Project, (theboneyardproject.com) a massive venture in which selected contemporary artists resurrect disused military aircraft turning them into art objects. Eric Firestone Gallery is located at 4 Newtown Lane in East Hampton, New York. The gallery is open seven days a week from 10am to 6pm.